l ADDITIONAL CAPABILITIES: One click to read I/M readiness plus display the data streams in graph for a quick check on vehicle’s engine healthy status to save time; Built-in DTC lookup enables you to quickly find the malfunction without checking on Internet. l HIGH HARDWARE: Features2.8-inch TFT 320*240 LCD display for intuitive diagnostic results display. Also it allows printing out diagnostic data recorded through connecting the computer via the USB cable supplied. l UPDATE& SERVICE: Free lifetime update on TOPDON official site and 12-month warranty. We offer 7/24 service for any questions and assistance needed via email, hotline and Forum FAQ. TOPDON, a new company rising in automotive aftermarket, is dedicated to focus on product development and innovation and attach due importance to user experience. Our distinguished experts and engineers ensure each product is well-designed and well-made, and our professional technical support team ensures every question is well-treated. TOPDON OBDCAN Plus, a small-size OBDII/EOBD scanner, is an entry-level cost-effective automotive diagnostic tool supporting full OBDII diagnostic functions, featuringcommonly-used diagnostic functions, built-in DTC lookup library and PC printing to help DIY amateurs rectify daily maintenance trouble codes effectively. • Erasing Codes & Reset: Turns off Check Engine Light (MIL), clears codes and resets monitors. • Live Data: Show the information of continuous data stream from vehicle in live graphic (waveform) display. • Freeze Frame Data: Check the certain vehicle conditions which are recorded by the on-board computer at the time the emission-related fault occurs. • I/M Readiness Status: Check the operations of the Emission System on OBDII compliant vehicles. Indicate which of the vehicle’s monitors have or have not yet run and completed their testing and diagnosis of their designated sections of the vehicle’s emissions system. • O2 Monitor Test: Allows retrieval and viewing of O2 sensor monitor test results for the most recently performed tests from the vehicle’s on-board computer. • On-Board Monitor Test: Retrieves and displays test results for emission-related power train components and systems. • Component Test: Allows initiating a leak test for the vehicle’s EVAP system. • Vehicle Information Retrieval: Retrieves VIN, CINs, CVNs and In-use Performance Tracking on 2000 and newer vehicles that support Mode 9. 2. 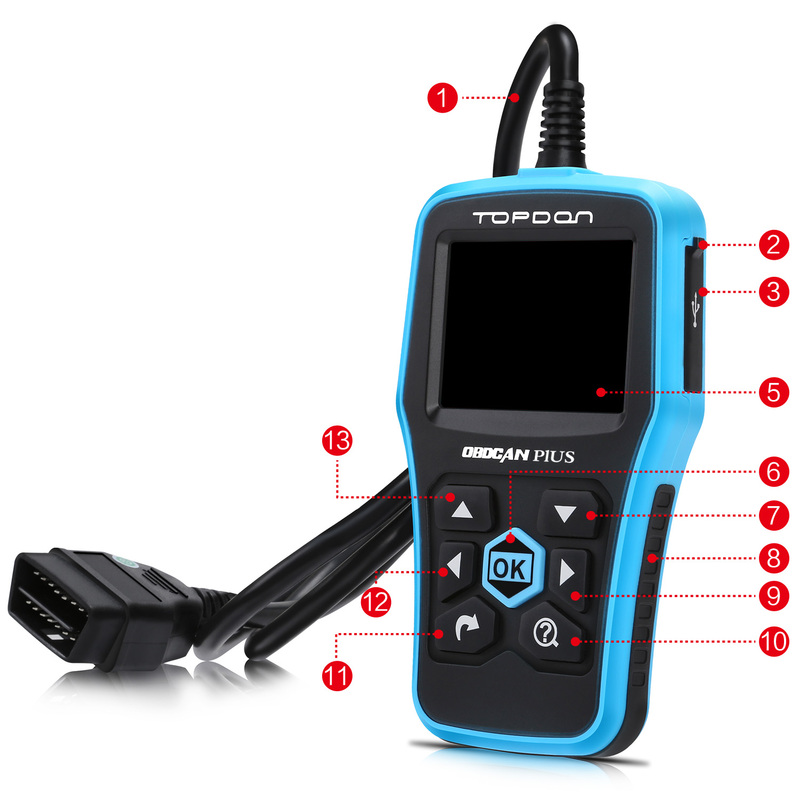 Built-in DTC Lookup: TOPDON OBDCAN Plus offers diagnostic trouble code definitions helping and fast guiding you to fix the car, making sure you can easily understand the problem and the solution. 3. Graphical Display: The OBDII scanner displays the data streams in graph, which will clearly show the data and you can make sure whether the data are in normal range and deal with some malfunction parts. 4. Data Record and Replay: It supports not only the data retrieval but the record and replay. You can have an easy data analysis for different types of data at all times and places, including trouble codes, live data and freeze frame data. 5. Considerate Design: Featuring high quality hardware, the OBDII code reader allows print out diagnostic data recorded by the scan tool. Also, users may enjoy the lifetime free upgrade online with multilingual support. Free lifetime update: connect the tool with PC, download the file and follow the steps to update the scan tool. Feel free to get technical support via email/Q&A, or hotline on our official site, Facebook, or Twitter, if you are unsure if the scanner tool is suitable for your vehicle, or any questions.